On the face of it, Damien Jurado had his work cut out. Given that Blind Tiger punters are more commonly found dancing to dub soundsystems or going nuts to Balkan big bands, we were worried how the singer’s trademark melancholy would fare on such a hot and humid night. Nevertheless, when an unassuming man in a plaid shirt got up on stage, the tightly-packed crowd expectantly simmered down. 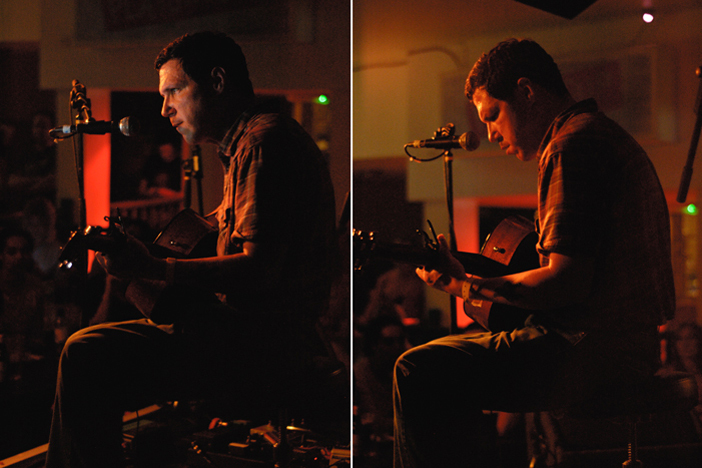 Is that Damien Jurado or just a rather timid soundman? Without saying a word he launched into ‘Museum Of Flight’ and the room fell silent. There’s no mistaking that voice. 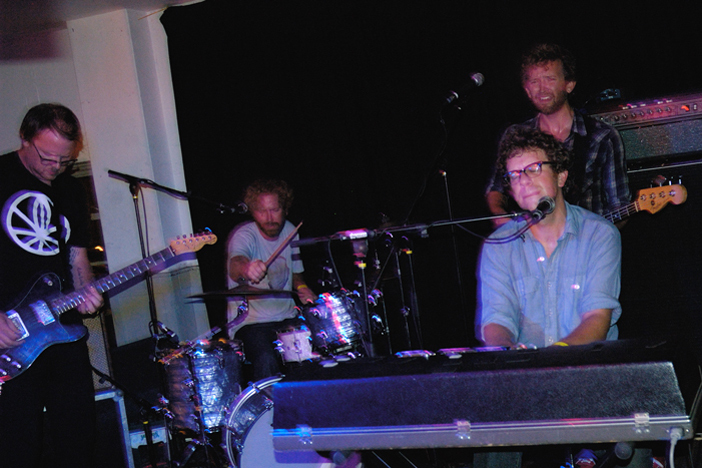 We had been adequately warmed up by the summery pop prog of Megafaun, but this was something else altogether. 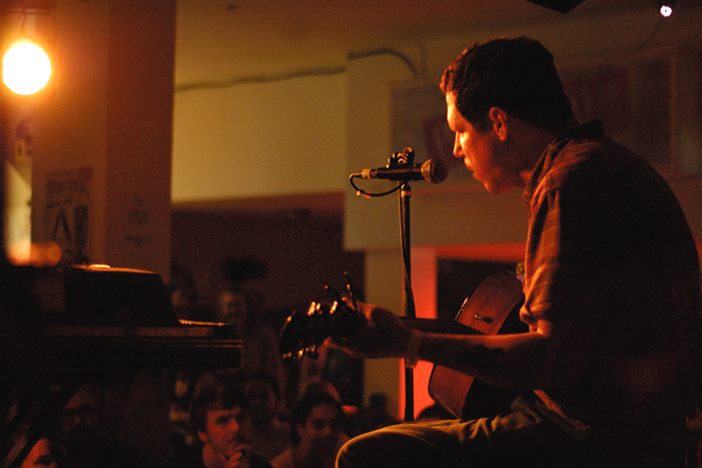 By the end of the song Damien Jurado had cast his spell, putting our silly fears to rest and defiantly staking out his territory. We were in his world now, whether we liked it or not. Seemingly it’s a world overcast with nostalgia and crammed full of heartache. By song three the room was rapt, and he’d still not spoken a single word. Jurado has the sort of singing voice that makes banter seem like an unwelcome intrusion. Which is just as well, as the man looked painfully shy whenever he wasn’t playing. There’s a simplicity to songs like ‘Sheets’ and ‘Everything Trying’ which is hard to pin down and even harder to affect. The sound is perfectly balanced and he never fluffs a note – yet the sum is greater than this. Jurado’s music has an honesty that redeems the maudlin attitude and makes it impossible for the oft-hurled ‘miserable’ slur to stick. It’s just one man with a guitar, but it does everything it needs to. There are touches that recall the meandering calmness of Nick Drake ballads, and others that show the stamp of Americana indie ala R.E.M.. Jurado’s Seattle background probably accounts for the echoes of grunge that crop up in places, but it’s more in the chords than the sentiment. 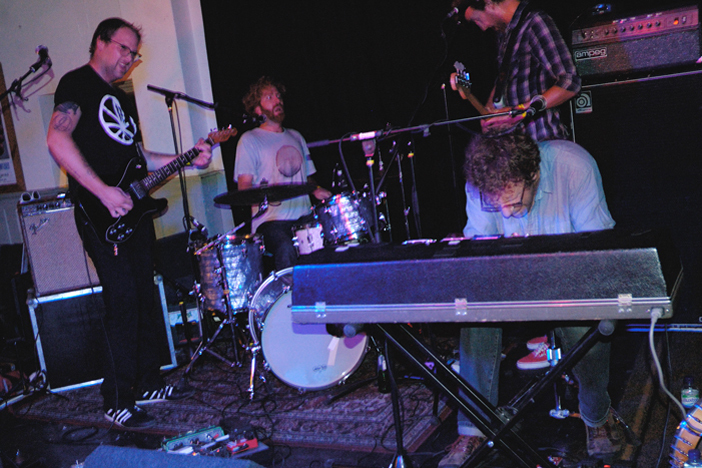 Although his recent collaborations with Richard Swift have extended his songwriting range to embrace the dynamics of a full band, Jurado’s performance tonight is a decidedly stripped-back affair. He plays several songs from the recent ‘Maraqopa’ album, but here they’re exhibited in their natural state, as it were. Taken alone, the songs don’t require anything else – but an hour-long set of down-tempo minor key guitar songs is bound to flag sooner or later. Perhaps feeling this, the crowd start to test his between-song vow of silence. The fake whooping that came from the back of the room was just rude, threatening but failing to dispel the atmosphere. However, later on, one front-row punter took it upon himself to lighten the mood: “Welcome to Brighton, Damien!” This elicited a meek “thank you” – the singer’s first non-sung words of the night. After this, he became almost chatty. Having wrapping up the planned set with the majestic single ‘Arkansas’, Jurado got out his laptop and treated us to some brand new songs written a few days before. These were something of a departure – bittersweet 60s-sounding pop songs with quaint upbeat melodies. It was a curious turnaround, almost as if the heckling had allowed him to open up. 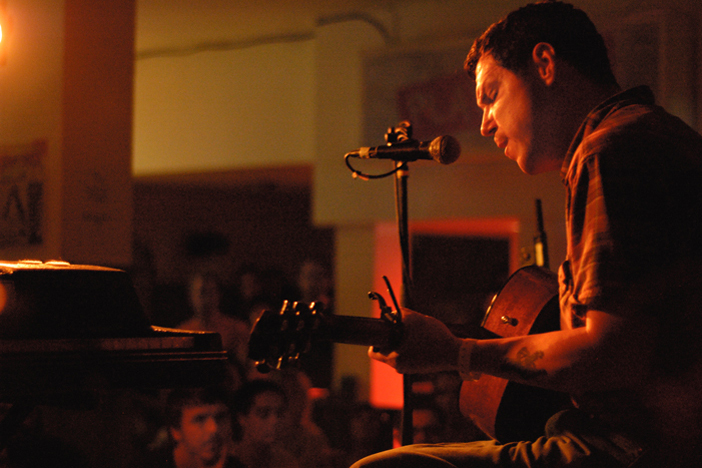 We left wondering if the tone of new songs meant there was a little less heartache in the world of Damien Jurado these days.